Convert flat 2D images into 3D surface or contour plots or 2D published graphs into real numbers. Perform complex 2D analysis from the output of the 2D/3D digitizer or supply your own data. Are you a stock market analyst or a business man who needs to analyze his competitors data? - convert an Internet chart into "real" data. Scientists, Engineers, students who have a graph in a publication or found one of interest on the Internet but needs the "raw data" - use 2D Digitizer. Cartographers - map your old maps into real numbers! Just need to analyze existing data? The included 2D analysis plotter will fill your need. Multi-variant curve fitting such as polynomial, exponential, moving averages and more. 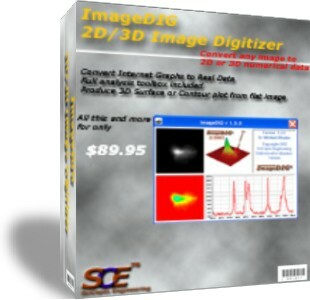 ImageDIG consists of three integrated modules which allow you to convert 2D flat images into 3D (x,y,z) data or if a graph, convert the graph in image form into 2 dimensional numerical data. The third module is a full analysis plotting utility where you can import either the 2D or 3D data saved above or import any number of columns of data from a file. The data can then be analyzed using several built in statistical functions and plotted immediately to the screen. twain - scanners, cameras, etc. clipboard - Web pages, application programs, etc. Export 2D (x,y) 3D (x,y,z) data in comma, space or tab delimited format and import into a spreadsheet, database or other application. Save scanned images in several common graphic formats or import directly into your word processor or any Windows application with the clipboard feature. Customize your plot labels, colors, fonts, line styles, grids, legends even add your own background picture. Feel free to contact us at support@imagedig.com if you have any questions.